A Mild Shanghai Lawyer and His Accidental Crusade. (Foreign Desk)(THE SATURDAY PROFILE) Howard W. French. WHEN Guo Guoting pauses to think about the course his life has taken, it is the jagged lines, the result of a series of accidents, that impress him most. As a college student, he set his sights on physics, but his score on the graduate study exam betrayed him, so he ended up studying law instead. After graduation from law school, he was sent by the government to be a judge in Fujian Province. Upon arriving there, he was told that what the courts really needed was lawyers, so Mr. Guo complied and went into practice. Mr. Guo eventually settled in Shanghai, where he became established in shipping law. Here, his life was altered once again by events more unexpected than anything that had come before. His troubles began when he heard about a law school classmate who had been jailed for taking on the Shanghai authorities over the sudden eviction of neighborhoods marked for real estate development. The classmate, Zheng Enchong, had not been a close friend. Mr. Guo said he barely recalled him, in fact. But hearing the man had been jailed -- after a five-hour secret trial -- for filing hundreds of lawsuits on behalf of dispossessed Shanghai residents, and recognizing that no other lawyers would represent him for fear of being blacklisted, or worse, Mr. Guo said he felt compelled to step forward. The rest, as they say, is history, personal history of the brutal, hard-knock variety commonplace in China, a place that may be changing rapidly in many ways but where one old rule endures: you can't fight City Hall. SINCE he was a young man, Mr. Guo said, he has dreamed of a quiet life in a small village somewhere, a life in the shadows of a mountain in a small house close enough to a river or brook to hear the gurgling flow of the water from his study. 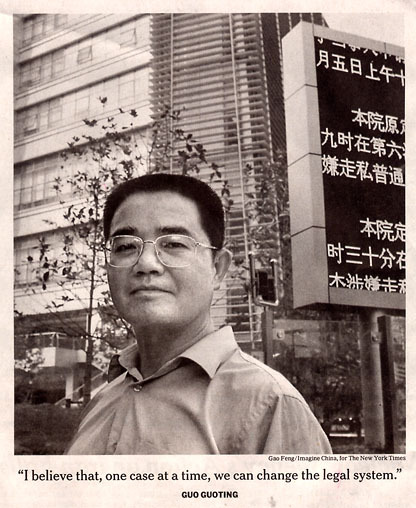 For his efforts to defend a friend and principle, Mr. Guo has recently been driven from the law, deprived of a livelihood after most of his paying clientele was scared away, but not before adding his name to a long and growing roll of accidental activists, people driven to do something in their own immediate spheres by the intolerable injustices they encounter in everyday life. One of those is the dispossession of the powerless, which has long been the dirty little secret behind much of China's extraordinary urban development. Local authorities have been able to condemn buildings and clear land without so much as a hearing, and distribute the land to developers in murky, no-bid sweetheart deals. In Shanghai, a fantasyland of skyscrapers today in a city where tall buildings scarcely existed only 15 years ago, these stories have a particularly breathtaking quality to them. In some instances, residents of old properties in choice areas of the city have been summoned to the police station only to return and find their houses demolished. Mr. Zheng had angered local officials by filing a series of lawsuits and court motions designed to at least slow the land expropriations. In a touch that could have been borrowed from Kafka, the city government accused Mr. Zheng of violating security laws for faxing public documents about a real estate case to a human rights group in the United States. That was when Mr. Guo took up his case, filing an appeal for his schoolmate in the Shanghai High People's Court. Immediately, he said, there were warnings to stop, subtle at first, but then increasingly menacing. Then his main business, representing maritime shippers, began to fall off, his clients frightened away. ''The authorities called me in 18 times to tell me to abandon this case,'' he said. ''It's not a legal matter, it's a political matter, they'd say. Mr. Zheng remained resolute, but his appeal was ultimately rejected. Mr. Guo's feelings about social justice developed only gradually. Slowly, in the course of his practice, activism bit him, he says, as he began exchanging ideas with other lawyers about how to improve the workings of China's rickety legal system and to protect individual rights. Encouraged by colleagues, Mr. Guo eventually began posting his thoughts on legal issues on the Internet. He emerged as a prominent figure in local law circles, someone looked up to and regarded with awe by younger lawyers. SEEN again more recently, after the news that Mr. Zheng's appeal had been denied, the lawyer seemed like a different man, defeated, even depressed. Another case he had taken on, an even more radical challenge to the system, was now headed to a foreordained defeat. It was a defense of a citizen's rights under the Constitution to try to form an independent political party. Speaking at a teahouse, dressed casually in short sleeves, Mr. Guo somberly announced he was quitting the law. He had been spending his own money to argue cases like these and had not had any income for the last four months, and could not support his family. The political case had meaning for him because he saw some value in putting his arguments on the Internet. ''It is the demand of the people and of the times to end one-party rule and to free the press,'' he wrote in his bold summation. The authorities, however, had already blocked Mr. Guo's writings from the legal Web sites he once used.